The Greater Spotted Eagle (Clanga clanga) is one of the rarest birds of prey in Europe, which – according to the IUCN Red Data Book – has a vulnerable status with a decreasing global population. This treasured bird of prey prefers the remote regions of wetland habitats and is very sensitive to human disturbance. One of the largest populations of Greater Spotted Eagle, with 120-150 nesting pairs, live in Belarus. More individuals are found here than in the entire European Union. Research carried out by Belarusian scientists proves that Polesia is critically important for the survival of the species, because of the density of nesting pairs in its central part. APB-Birdlife Belarus started a national campaign in 2000 to call the attention of Belarusian citizens to the challenges linked to birds. One species is selected each year to be the focus of the campaign. For 2019, the Greater Spotted Eagle was chosen as the Bird of the Year. This will help APB to continue its existing “Save an eaglet!” fundraising action, which includes organizing expeditions to find and monitor nests, then mobilizing volunteers and legal tools to protect the precious breeding sites. The threats for the species include land use changes linked to construction of forest roads, housing and industrial development, intensification of forestry, and modification of habitats due to hydrological changes. 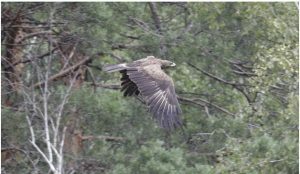 The building of the E40 inland waterway would cause hydro-morphological changes in a great extent of Polesia, which – through habitat modification – directly threatens the largest breeding population of Greater Spotted Eagle in Europe.